Best known for his early 1960s character Dobie Gillis in the CBS sitcom "The Many Loves of Dobie Gillis", actor/producer Dwayne Hickman is now devoting his time to creating art. He says that, although he has been in show business since he was six, his true love has been art and architecture. Fifteen years ago, encouraged by his wife, he began to devote his energy to his artwork. 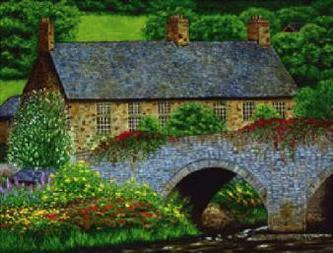 The image posted here is "The Old Stone Bridge" by Dwayne Hickman. Friday, August 10, 2007 and Saturday, August 11, 2007, Hickman will display his artwork at Wildwood Gallery in Big Bear Lake, California. An Artist's Reception will be held Friday at 7:00 p.m. Contact the gallery for more information about the event. Dwayne Hickman is listed on page 2 of the Pop Life Art Celebrity Artists List.